Polar Shifting -  An epic journey of new discovery so fantastic that our natural instinct would be to block it out. The sky has changed, claim Inuit eldersThe Inuit elders note climate change in the melting glaciers, deterioration of sealskin, and burns on seals, and disappearing sea ice. The attribute these changes in climate to changes in the sky.The tribal elders claim that the sun no longer rises where it used to rise. The days heat up more quickly and last longer. The stars and moon are also in different places in the sky and this affects the temperatures. This is a population that relies on the placement of the moon and stars for their survival as they live in total darkness during part of the year. The Inuit people inhabit the far northern reaches of the Canadian Arctic and have done so for centuries. The area they inhabit is almost continually frozen under a layer of permafrost. For months at a time, their days begin and end in darkness. A nomadic people, they built tents or teepees of caribou skin in warmer months, and lived in igloos in the winter. Previously, they were known as Eskimo. The word Eskimo is from a word in their language that means "eater of raw meat." This group of Arctic dwellers has now been renamed Inuit, a word that means "the people." Inuk is the word to describe one member of the tribe, or "one person." The Inuit speak many different dialects that all stem from the Eskimaleut or Inuit-Aleut language. They are primarily hunters, relying on Arctic wildlife for their survival. They fish, hunt sea mammals, such as seals and walrus, and land mammals, like Arctic hare and caribou and use seal skin and blubber for clothing, tents, and fuel. Most of their diet is made up of raw meat as there is very little plant life in their environment. Earth is basically bottom heavy and top light due to the land-based ice in the south pole region. There is very little land-based ice in the arctic circle except for Greenland & Iceland. Antarctica acts as a gyroscopic anchor point to maintain balance of the planet. Much like a child's toy which continues to upright itself when knocked over. As the weight of the south pole ice diminished from melting the earth began to shift on its axis. The more land-based ice melts the more the earth shifts. As the land-based ice melts into rising Ocean levels, the weight becomes disbursed as water. Some Planetary shifts are smooth & gentle and occur without notice. However, sudden sharp shifts result in severe Tsunami's & earthquakes. The Tsunami's are caused by the shifting, not the earthquake... much like a bowl of water sloshing as it is carried. This is why some earthquakes seem to produce Tsunami's while others do not. Because the earthquake does not cause the Tsunami. The movement of the earth shifting is what causes the Tsunami. If there is no shifting in conjunction with an earthquake, then there is no Tsunami. This is my theory. This is why we don't incur a tsunami each time a large earthquake occurs. 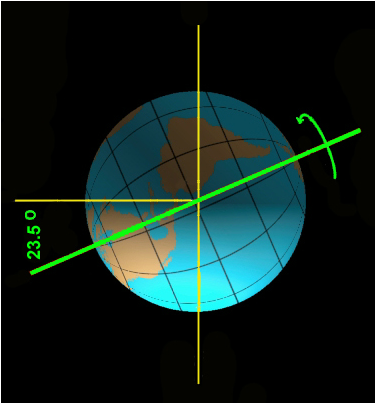 Earth has already shifted about 1200 miles to the south in the summer & an equal amount north in the Winter based on the position of the sun at sunrise & sunset on the summer solstice. 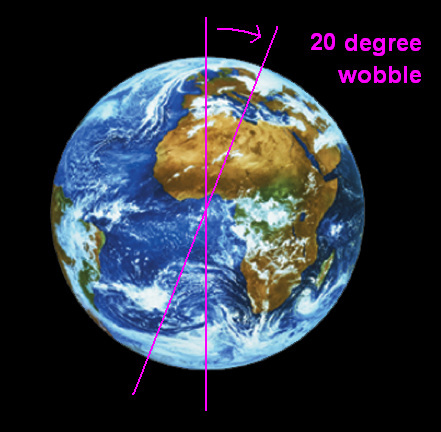 At some point, the Earth will slip onto its side on the equator which is heaviest and the largest circumference. 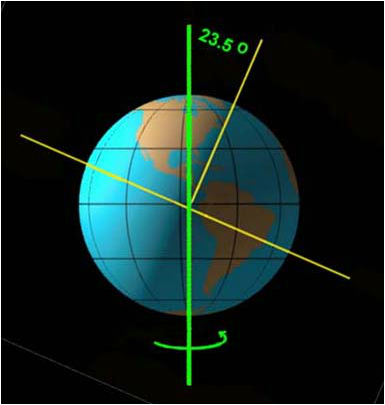 Unlike some theories, the Earth will not upside down because it is top light & does not have enough weight to invert. We would have been better off inverted than on our side with the poles horizontal but we have insufficient Arctic weight to complete the inversion. Examples of our current change in axis tilt and our future sideways orientation are shown below. 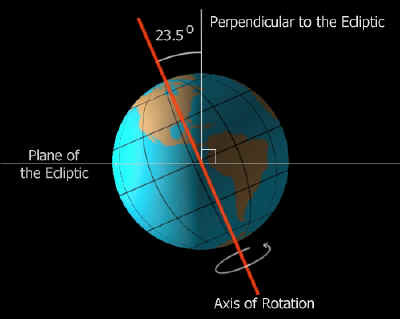 Keeping in mind, that once the polar regions are horizontal, as we orbit the sun, the equator will face the sun for 3 months, twice a year for seasons #1 and #3. 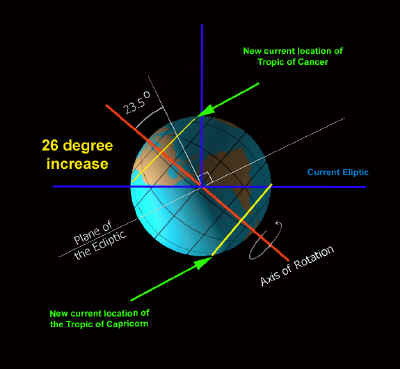 Of the other 2 seasons, one pole will face the sun for 3 months (constant sunlight & constant heat 24/7, season #2) while the other faces away from the sun (constant darkness & constant freezing 24/7, season), then the poles will reverse position during the opposite season #4. We can survive seasons #1 & 3 but the only way to survive seasons #2 and 4 would be to live underground or at the equator.